BactoBeads™ are non-pathogenic, freeze-dried microbes (bacteria and lower eukaryotes) that are easily cultured for use in the classroom. Each bead contains microorganisms, buffer, salts and nutrient broth in an instantly soluble pellet. Biotechnology Basics - What is a Model Organism? A model organism is any plant, animal or microorganism that allows us to study fundamental questions in biology that may be hard to study directly in complex organisms like humans. 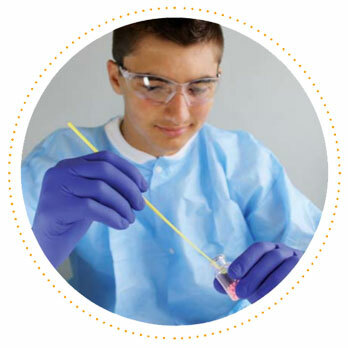 In brief, the Next Generation Science Standards are a set of guidelines that focus on preparing students for careers in STEM fields including biotechnology, engineering and technology. These new set of standards were set in place to help teachers explore the fundamental concepts important to STEM fields – Life Science, Physical Science, and Engineering and Design. The development of DNA sequencing technologies has revolutionized biology and medicine. DNA sequencing is an essential component of multiple biological disciplines, including basic and therapeutic research and medical diagnostics. In the research laboratories, a scientist’s notebook represents a comprehensive record of the experiments that were performed, why an experiment was performed, and what the results mean. The basic unit of all living organisms, from bacteria to humans, is the cell. Contained within the nucleus of these cells is a molecule called deoxyribonucleic acid (or DNA). Today, we know that DNA is the blueprint used to build an organism – our genetic makeup, or genotype, controls our phenotype(observable characteristics). The directions coded for by our genes controls everything from growth and development to cell specification, neuronal function, and metabolism.